So bad its good serial concerning magnetic disturbances coming from Africa. Kane Richmond leads an expedition to discover the source and runs into the lost city of Liguria and its mad ruler. What can I say this is wild and wacky and so out there that there is no way that you can't help but enjoy it and its unintentional humor. 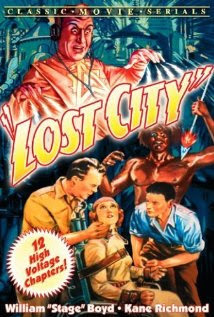 An odd mix of science fiction and jungle adventure that is a concoction that only Hollywood would dare give us. I'm at a loss for words, I mean what can you say about a serial that has people stretched into seven foot giants? Insane. And you should be warned that the portrayal of blacks is racially insensitive, but at the same time its so wrong headed that you feel more sadness at how stupid the people who made the serial are, were they really that stupid?. To be certain its almost compulsively watchable, the silliness and wrong headedness of it all is helped by the use of stereotypical serial dangers (and in its way this is the perfect stereotypical serial). If you miss Mystery Science Theater 3000 you'll want to see this.